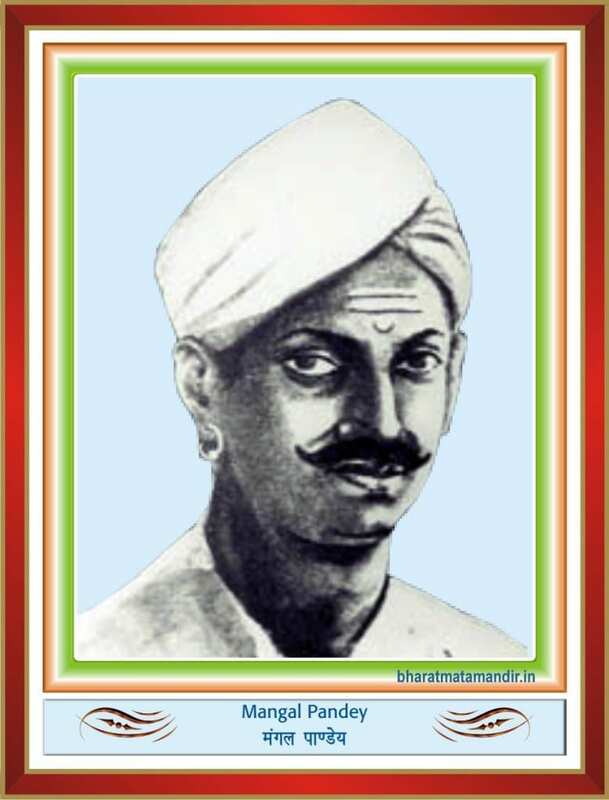 Mangal Pandey (July 19, 1827- 8 April 1857) also known as Shaheed Mangal Pandey was a sepoy (soldier) in the 34th Regiment of the Bengal Native Infantry (BNI) of the English East India Company. Pandey was born in the village of Nagwa in district Ballia (U.P.). He joined the British East India Company forces in 1849 at the age of 22. Mangal Pandey was a devout Brahmin and he practiced his religion diligently. At Barackpore near Calcutta on March 29, 1857, Mangal Pandey raged in front of the regiment’s barracks on the parade ground, armed with a loaded musket, calling upon the men to rebel and threatening to shoot the first European he set his eyes on. He fought a short fierce battle with British officers and some Indian soldiers of the regiment. Later, Pandey put the muzzle of the musket to his breast and pressed the trigger with his foot. He collapsed burnt and bleeding but not mortally wounded. He recovered, was brought to trial less than a week later and was sentenced to death by hanging. His execution was scheduled for April 18, but was carried out ten days prior to that date. The Primary motivation behind Mangal Pandey’s behavior is attributed to a new type of bullet cartridge used in the Enfield P-53 rifle which to be introduced in the Bengal Army that year. The cartridge was rumoured to having been greased with pig and cow fat, not consumed by Muslims and Hindus respectively, the former being abhorrent to Muslims and the latter a holy animal of the Hindus. The cartridges had to be bitten at one end prior to use. The mutineers were of the opinion that this was an intentional act of the British, with the aim of defiling their religions. The attack by, and punishment of, Pandey is widely seen as the opening scene of what came to be known as the ‘Indian Rebellion of 1857’, an incident that sparked the First War of Indian Independence. The Government of India commemorated Mangal Pandey by issuing a postage stamp bearing his image on October5, 1984.